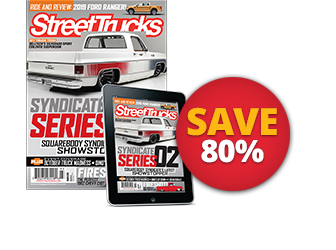 For the last decade and a half, Heath Spurling of Fort Worth, Texas, has had a hand in the custom truck scene. 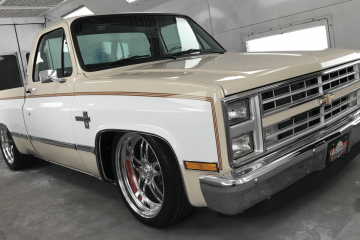 His second family is Body Drop, Inc., and in accordance with his club’s name, previous builds include a body-dropped Nissan Hardbody, Ford Ranger and Chevy Silverado. 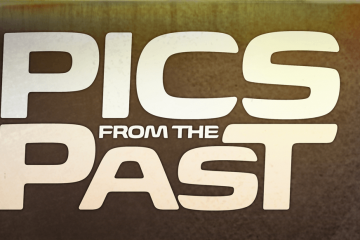 His beloved Myrtle, however, is his most cherished build because the ’62 step-side C-10 is such a timeless model. 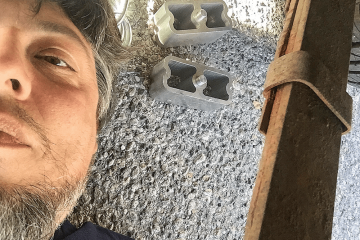 Heath purchased the Chevrolet in late 2015, and he began his dream build shortly after. Believe it or not, in six month’s time the end result is what you see here. The bones of the classic Chevy are heavily fortified. The custom chassis was built from robust 2×3-inch tubing and 1.5-inch round tube by Tony Cano of Evotime Custom in Haslet, Texas. In addition to the back-half, Myrtle sports a Porterbuilt Version 7 Dropmember and CPP 2.5-inch drop spindles up front. The rear uses an N’famous Watts-link setup with OEM trailing arms and Monroe shocks. Air Lift 2600 Dominator airbags sit at all four corners for ultimate lows. SIMPLE, CLEAN AND CLASSIC WITH MODERN UPGRADES IS EXACTLY WHAT MYRTLE IS ALL ABOUT. Cragar 15×7-inch wheels rest comfortably underneath the step-side’s low-slung fenders. The classic rollers are paired with 235/65R15 Diamondback whitewall tires. 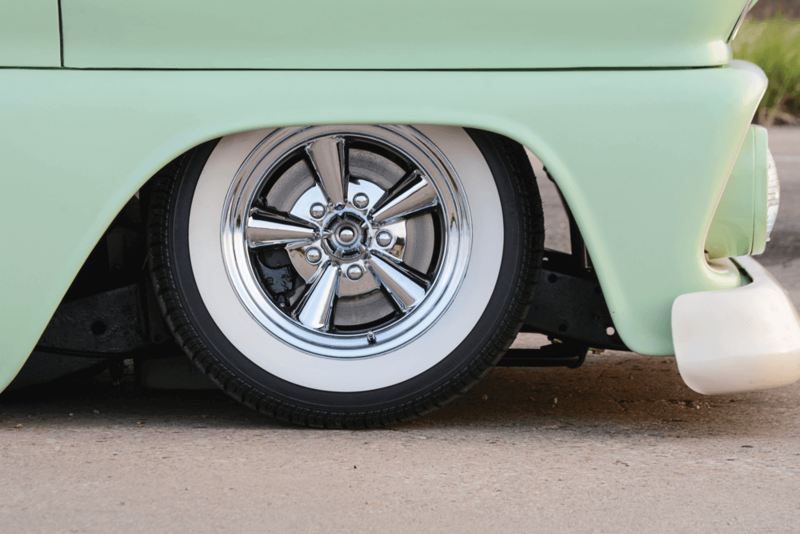 The combination of the whitewalls and Cragar five-spokes is famous and finishes off the classic stance with a flourish. The wheels sport a full polish. Myrtle’s stopping power, like the rest of the truck, is comprised of efficient factory design and modest modern upgrades. In the rear, refurbished OEM drum brakes remain, but the fronts have been exchanged for CPP disc brakes. The piston-pushing calipers are combined with 11-inch rotors, a CPP master cylinder and booster. 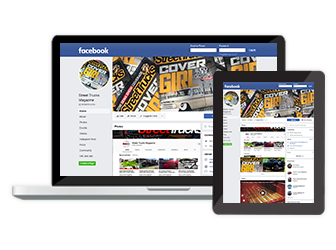 A CPP power steering unit does its part to modernize driving feel and safety features. Putting the brakes to good use is a healthy 1989 5.7L Chevy small-block V-8. The motor is accessorized with multiple polished and paint-matched components. 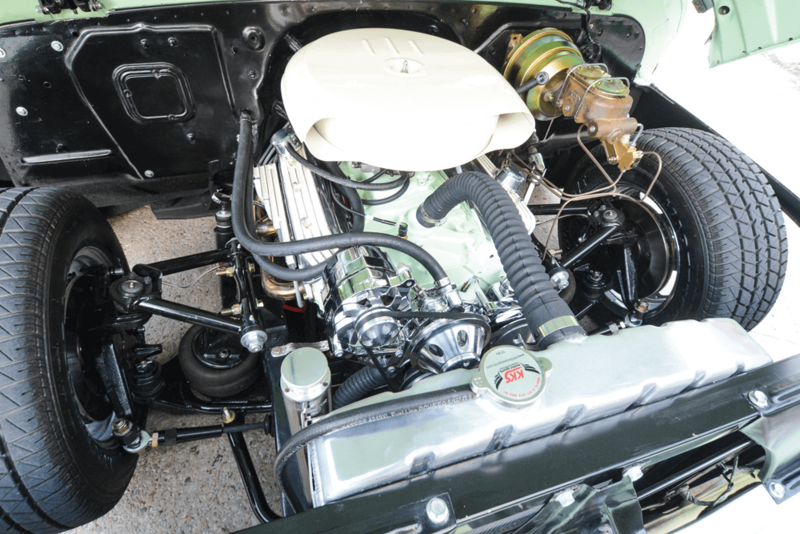 A color-matched Cadillac air cleaner and aluminum finned valve covers with color-matched outers brings Myrtle’s beautiful exterior through to the engine bay. The V-8’s rumble is carried through Speed Engineering headers and dual Flowmaster mufflers, with a custom exhaust in between. 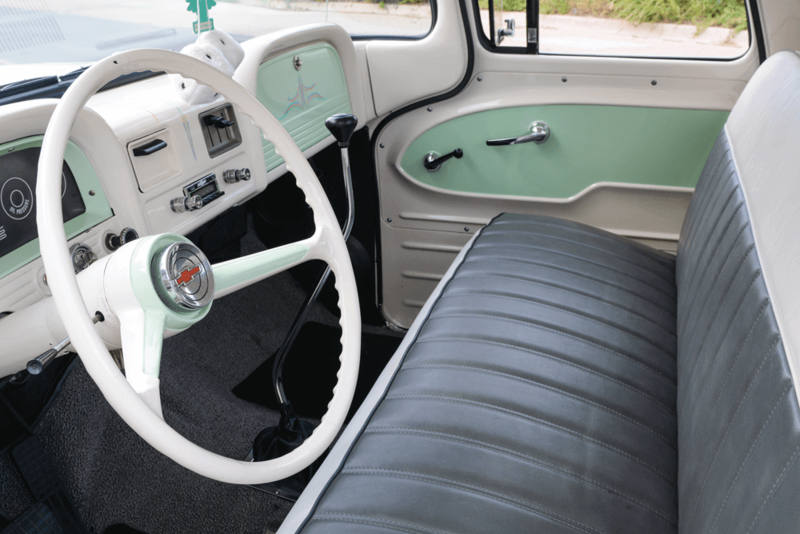 MSD wiring manages the ignition, while a four-core aluminum radiator and 15-inch electric fan take care of the cooling needs. Finally, the powertrain was finished off with a Chevy 350 automatic transmission, two-piece driveshaft and 1986 10-bolt rearend. 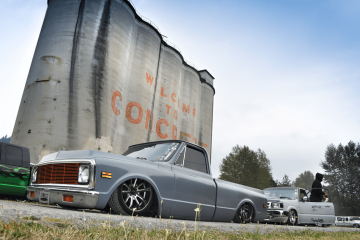 The key to the equation that is Heath’s C-10, is simplicity; this is perhaps best demonstrated by the nearly untouched body and exterior. Apart from the slammed stance and alternative wheel choice, all of the factory styling remains. Every single body panel is the one that Chevrolet built in 1962. The only exterior upgrades are clip-on-style polished mirrors, a MAR-K wooden bed kit and Porterbuilt hood dampers. The minor touches are perfectly subtle additions that enhance Myrtle’s clean style. The original bodywork, however, did not go completely untouched. 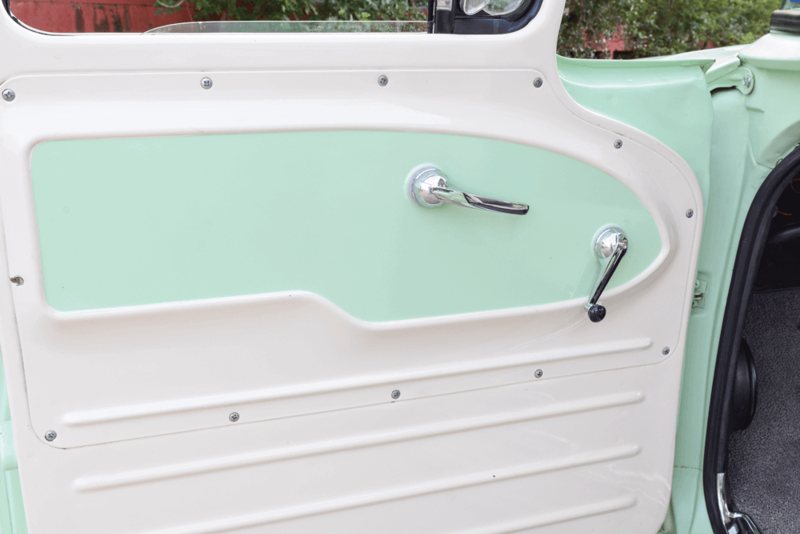 Myrtle is characterized by its signature Hot Rod Flats Gloss Green Mint and Classic White color scheme. The icing on the minty cake is salmon, black and green pinstriping, hand laid by Corey Angerine. 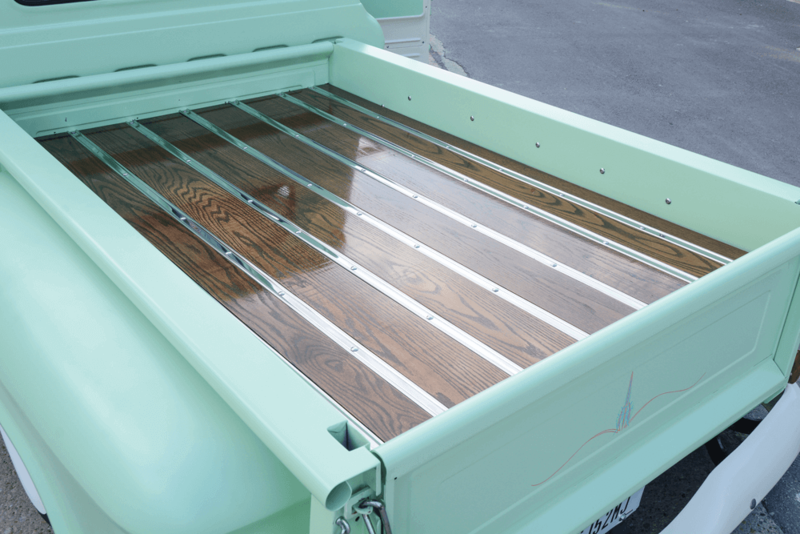 THE MAR-K WOOD BED FLOOR ADDS RICH CONTRAST TO THE EXTERIOR METAL WHILE MAINTAINING THE CLASSIC LOOK AND FEEL THAT HEATH WAS AFTER. Continuing into the cabin, the plan remains the same. What is essentially the factory interior has been updated and polished to demonstrate the classic beauty of an early-’60s era truck. 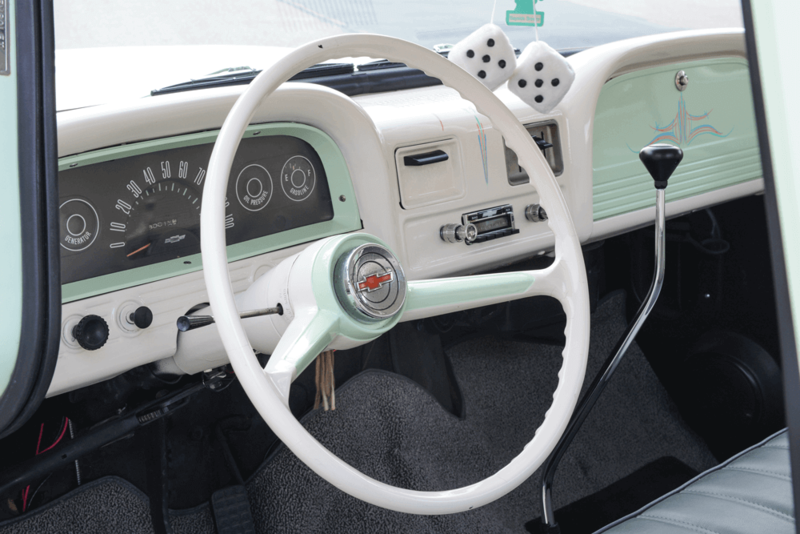 The original dash has been paint-matched to the exterior’s mint-and-white scheme. In the center sits an Auto Sounds factory replica head unit. 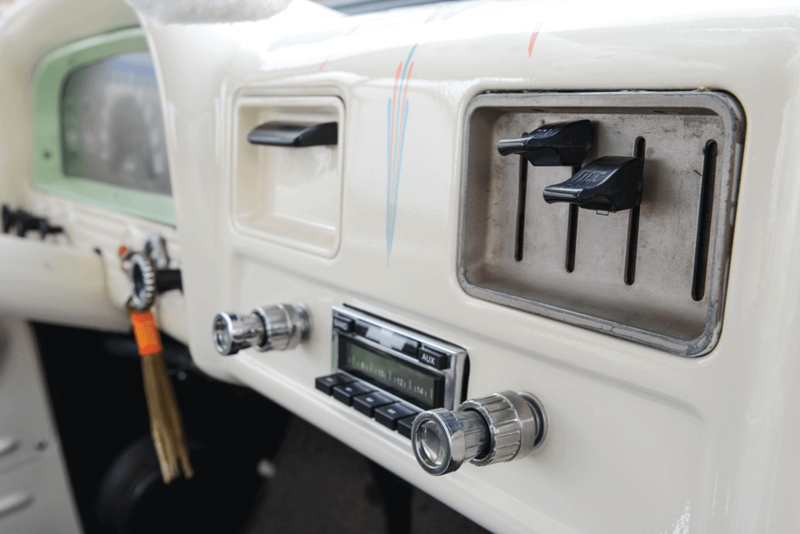 Behind the scenes are a 200-watt amplifier and 6.5-inch Auto Sounds speakers. The original bench seat remains in place, updated with white and gray vinyl. Gray loop-style carpet adorns the floor pan, and two-tone vinyl stretches up the door panels. The final touches are the continued pinstriping on the dash and the Lokar shifter. Simplicity and creativity will never cease to influence new builds. The less-is-more recipe is tried and true. What Heath and Myrtle prove is that attention to detail and purposeful design choices create timeless customs. 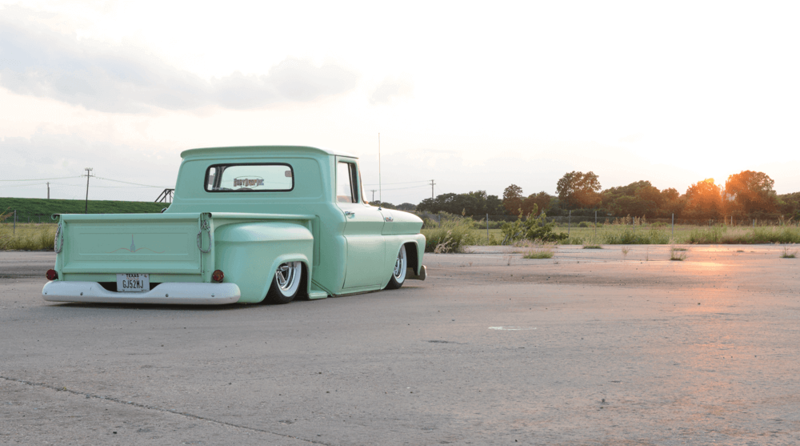 Myrtle relies on what is innately beautiful about the ’62 C-10 model and interprets it through a modern lens. The method is irrefutable proof that if it ain’t broke, don’t fix it. SALMON, BLACK AND GREEN PINSTRIPES LAID DOWN BY COREY ANGERINE ADD JUST THE RIGHT CUSTOM TOUCH.